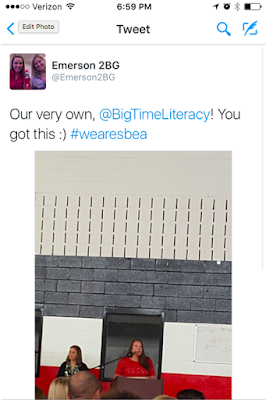 BigTime Literacy: do hard things. 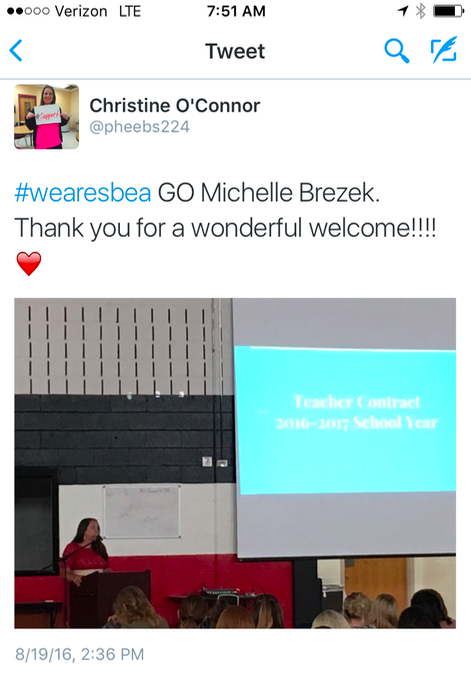 I've been involved with our local teacher's union for the past two years. This year, I've stepped into the new role of Social Media Chair, so I'm excited to stay connected. Additionally, this year, our co-presidents asked me to give the welcome address to our membership. I said yes, because I knew it would push me. They asked me just a few days ago. On the drive home that day, I was thinking about how I could go back and decline, and I could sit in the audience and just be passive and not have to stress. 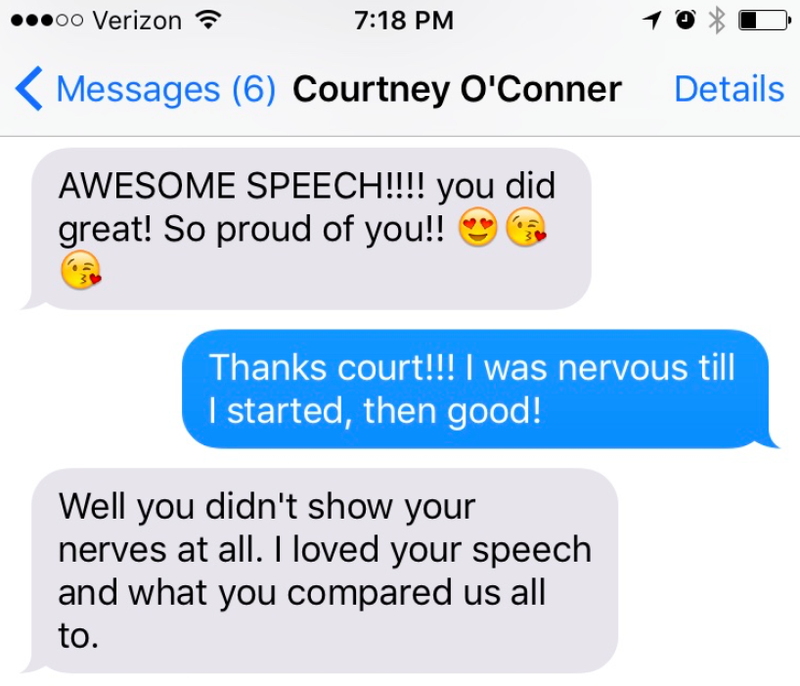 But in my heart and my gut, I knew I wanted to give the speech. So I said to myself, "Okay, just wait and see how you feel in a few hours." Well, I still felt the same, but I knew I had already said yes, and I've been working on doing what I say I'm going to do, to show integrity through my words and actions and not go back on something. So I just stuck with it. But I was nervous. Up until about noon on the day of (my speech was to be around 2:30) I was fine, I could set the nerves aside and just go about my buisiness. But then from around noon -2:30 (including when I did a practice read with a good friend) I was so nervous. Sweaty palms and racing heart nervous. But then I got up there and did my thing. When you do the hard things, it's exhilarating. And it's rewarding. I wanted to share my speech with you and also some of the tweets and texts I got, not because I am trying to brag, but because I want to encourage all of you to do the hard thing. Do them! If it's hard, it's making you grow, and when you do those hard things, you are rewarded in ways you can't imagine. So, here is the speech, and after, the notes from friends. Hi there! Welcome back to the 2016-2017 school year! My name is Michelle Brezek; I’m a teacher and Literacy Coach here at Heritage and the Social Media chair for the South Berwyn Education Association. 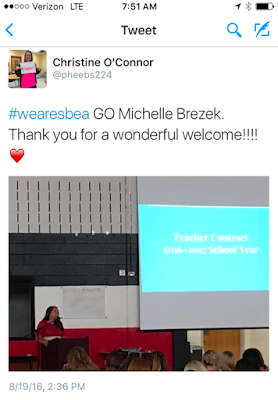 On behalf of the SBEA, it’s such an honor to welcome both returning and new teachers and staff to our amazing school district! 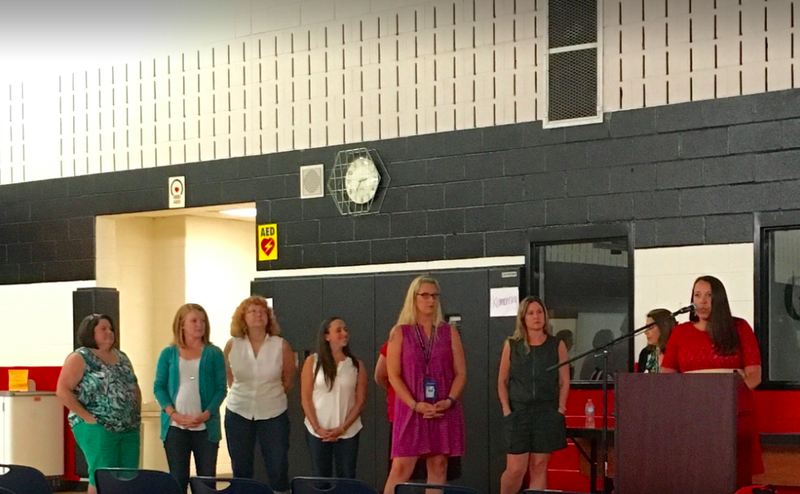 As I was thinking about what I was going to say to you today, I got to thinking about who were are, that is, the teachers in D100. We are passionate and dedicated educators, innovators on a global stage, and sometimes school supply junkies. We are multicultural, bilingual and inclusive of all. 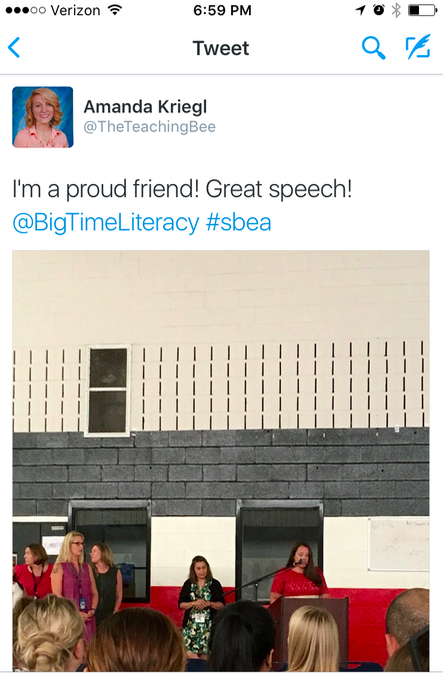 We are writers and shoe-tiers, mentors, and coteachers. We are athletes and coaches. We are sometimes or always obsessed with our craft. We are nurses with cough drops and social workers listening ears. We are researchers and problem solvers. We are jokesters, too, we want to have fun! We believe that in teaching and learning, anything is possible, especially when you look at it a different way, perhaps with a different mindset. This year, we will create possibilities and a future that no one has yet to dream, and we’ll be able to do that because of the talent, excitement, and knowledge that returns to our district each year. Which brings me to you, new teachers. It’s only the opening institute day, and so many of us have yet to meet one another, but I’m sure I can speak for all when I say we are so happy to have you here. We can’t wait to uncover the gifts you will bring to the lives of our students and everyone here in D100. Helen Keller once said, “Alone we can do so little, but together we can do so much.” I couldn’t agree more. As the year unfolds and our relationships grow, we will have so much to offer - to our students, to one another, to ourselves. It’s when we are united and working together that our efforts really flourish, with huge returns in student achievement and teacher engagement in the work we love so much. 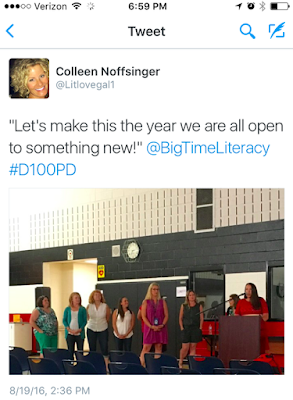 In the spirit of collaboration and unity, I hope you’ll take me up on this proposal: Open your classroom doors this year. Invite your team over to watch you teach. Get into other classrooms in your building and around the district. I know that it’s easier to not do this, you know, because sub plans are just another thing to do, but I can promise you, you’ll come back to your classroom refreshed with new ideas, new perspectives, and new energy. In addition to collaboration, dream those big dreams, but don’t stop there. Don’t save a hope or a dream in your head or your heart for one day, some day. Tell your friends about them! Write them down! Tweet it out to the world! It’s when we enroll others in our hopes and dreams that they become so powerful we’re able to manifest them into our lives and the lives of our students. Let’s make this the year we are all open to something new. Let’s look at things in a new light and consider different perspectives. Let’s dream new possibilities, declare them to be true, and then take action to achieve them. Together we can make this our best year yet! It's so not easy to do the hard thing. Colleen, thank you for capturing the moment for me and always being one of my biggest cheerleaders! 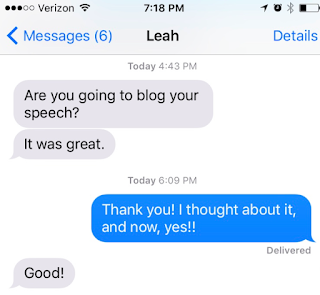 And two texts from two of the other Literacy Coaches in the district. Has anyone told you recently that they are proud of you? I mean, perhaps your parents have, and while that is amazing and rewarding, the feeling you get when a colleague or friend or even a significant other tells you that will blow your mind! 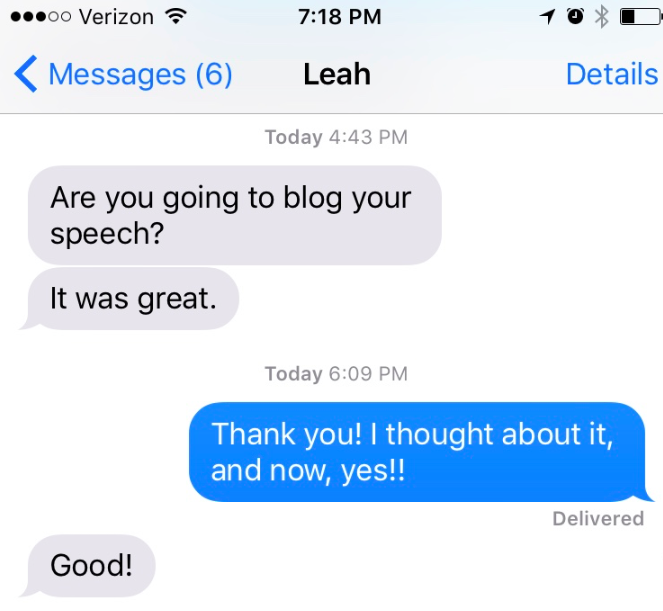 And a request for your speech to be published? I am so thankful for such a supportive community here in my district! It's a new school year. I'm in a new building - I'm back at the middle school! I'm teaching a 7th-8th grade ELA class and an 8th grade section of Challenge Based Learning. I'm also a homeroom teacher to some awesome 6th graders and have I have some coaching periods too. I'm once again out of my comfort zone, working with new people and actually team leader, too, which I haven't done before, and I don't even realize the things I'm missing. But I'm doing the hard things, so I know I'm growing. 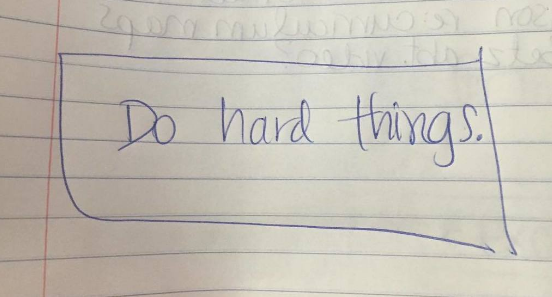 What are the hard things you're setting yourself up for this year? Leave a comment and let's keep the conversation going! One last thank you, to our keynote yesterday, Dave Stuart for an awesome speech, about writing, about teaching, and about keeping life in balance. 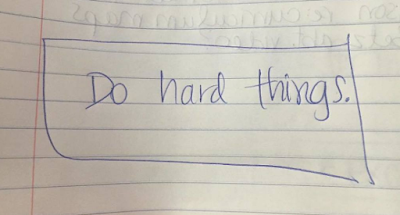 "Do hard things" was all him, applied easily to my life, and I'm sure, all my reader's lives, too!